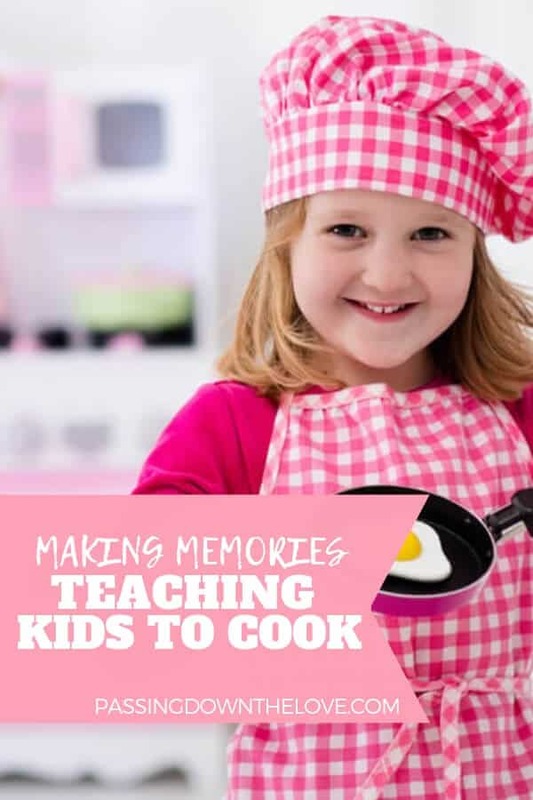 Teaching kids to cook and sharing your love of cooking with them at every age. Pass down a love of cooking to the next generation! 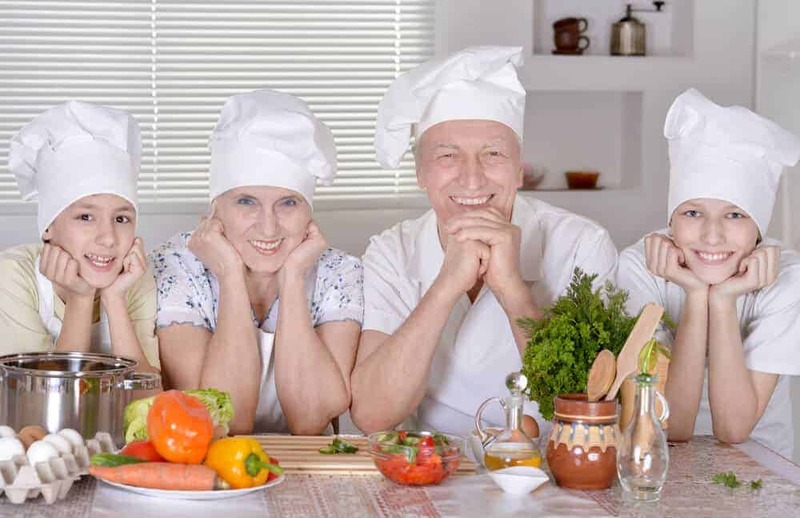 Cooking is a fun activity to do together. Teaching kids to cook, sharing your love of cooking and spending quality time perfecting an activity that can have a yummy outcome: Priceless! Kids appreciate new learning opportunities when they have a stake in the outcome, so make them part of the process. Kids that participate in preparing their food are more likely to try new things, find more foods they love and develop their ability to feed themselves one day. Teaching kids to cook now gives them skills they will use throughout their lives. Watch TV Cooking shows together, especially those feature Junior chefs and children in the kitchen. Decide on a recipe and go grocery shopping for the ingredients. Read books about cooking or get them a kid’s cookbook as a gift. Tour a restaurant (ask to go behind the scenes – maybe not during rush hour…). Some restaurants give tours. Just ask. Talk about your favorite foods and how they are made. Make holiday treats like Christmas cookies or Whipped Cream Salad. Take a cooking class together. Many grocery stores hold classes for kids. Instead of getting stuff, this would be a great experience gift. Go to a restaurant where they cook the food at your table. There are hazards, dangers and boo-boos just waiting to happen. Take time to access the dangers and prepare ahead to make your kitchen safe, make kids aware of the rules, and use precautions when necessary. Wash your hands before cooking and after using the restroom or wiping your nose. Warn of the dangers and precautions with heat. The stove, boiling water, pans. Be aware of hazards like sharp knives, cleaning products and the burn of spices like red pepper flakes and jalapenos. Don’t climb on the counters. Use a sturdy step stool to reach higher places. Wipe up spills, especially on the floor. Tie back long hair to avoid getting it in the food. Anything else I haven’t thought of but little kids would surely find. The age recommendations given here are suggestions only. Please consider the capabilities of the child. Not every child is ready at the suggested age and others may be able to handle more difficult skills at an earlier age. Use your best judgment to determine the tasks you assign based on the individual child’s level of ability. Children this age will probably make a mess, but that’s half the fun. Give them a chance and watch them smile. Showing them something new, giving them some unfamiliar gadgets to play with, talking and spending time together are the things that count! Let them make a mess. It will all wash off and it’s worth the effort. Play kitchen and food. Have them prepare something for you. Pretend. Arrange, stack and put items into measuring cups and plastic bowl as you cook. 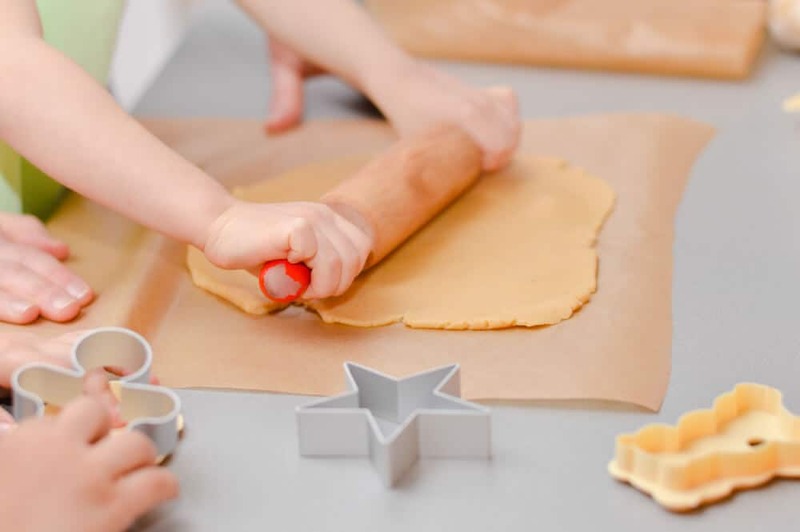 Let them draw in the flour, spread sprinkles, or cut out shapes with cookie cutters. They can mix dry ingredients, count out raisins or nuts, or simply put them from the bag or box into a container. Stand them up to the sink on a sturdy stool and give them plastic, non-breakable dishes to wash. Kids at this age are developing a little more dexterity, motor skills are improving and they can follow simple instructions. Give them some additional responsibility and a few more difficult tasks in the kitchen and watch them go! Use a rolling pin or cookie cutters. 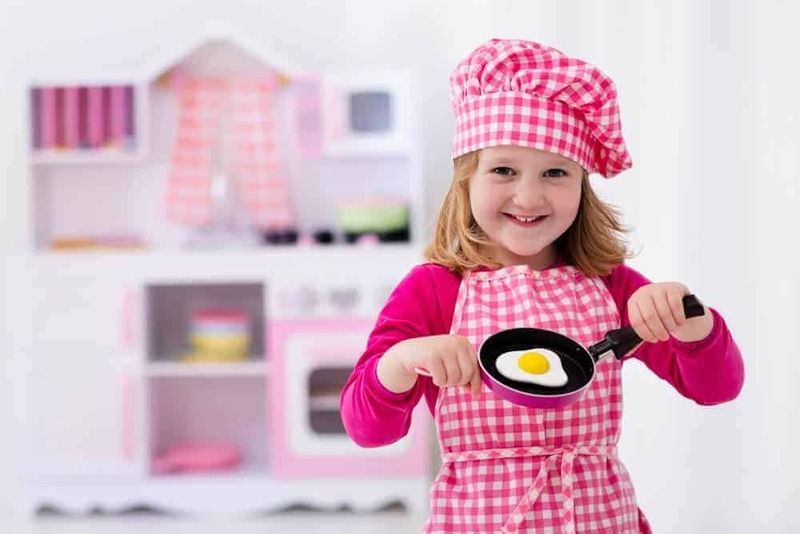 At this age, teaching kids to cook becomes a lot more about cooking than at earlier ages. They are beginning to read well, can follow simple recipes, and they are able to better understand instructions. Add to their skills by upping the game. Give them more jobs in the kitchen. If this age group is still interested in cooking, they will continue to join you in the kitchen. If they aren’t, let them opt out and choose another way to spend your time together. Budding chefs will enjoy handling these responsibilities. By the time they reach the tween years, teaching kids to cook becomes easier. Allow kids to dive in if they’ve been learning all along. If they are new to the kitchen – and even if they’re skilled, it doesn’t hurt to stay close by and supervise, at least from a distance. Let them show off their skills and take more control over the process. If you’re looking for 50+ more things to do with kids, click here and ask me for my free printable! Talk as you go with all ages, explaining in a way they can understand. With younger kids, talk about the color of the fruit. With older kids, explain the use of spices and how they work together to influence the flavor of food. Tell them stories about your Grandmas cooking, your favorite foods, and family dinners when you were young. Share your family’s recipes. Engage kids in conversation. They will learn from you and you from them. Whatever you decide to do in the kitchen while teaching kids to cook, always remember it’s worth it. It’s all about the fun, bonding, and yummy results. Hi Kimberly! I “meet” you through blogging grandmothers. Love your very pretty blog. My oldest granddaughter who is 5 years old loves to help me cook. She is a natural in the kitchen. Making cookies and muffins is her favorite tasks. Thanks for the special links for children, as I’ll explore them with her.